That’s been the conventional wisdom for years, particularly as smartphones became a hub of daily life. Slick handheld devices were seen as too expensive and complicated for them. 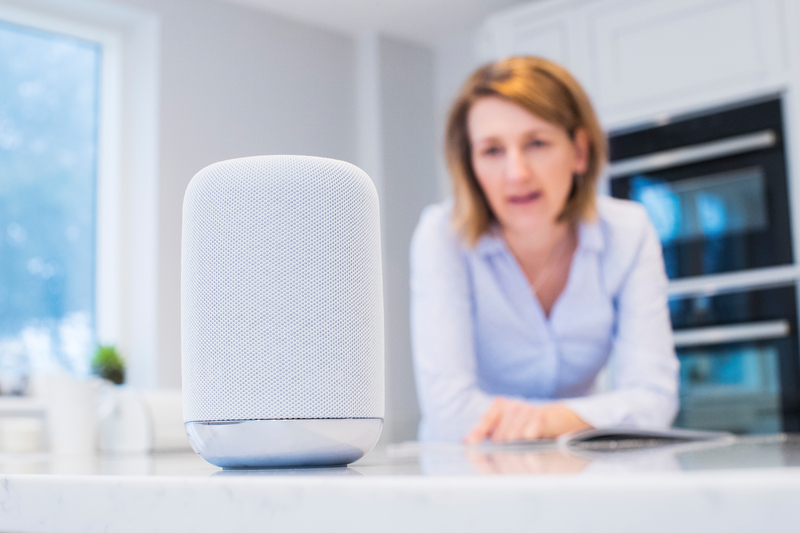 But Davis Park is a big believer that innovations in what’s known as voice-first technology — best exemplified by smart speakers such as Amazon Echo and its voice, Alexa — could make a big difference in helping older adults age in place and avoid social isolation. Park has seen firsthand the impact of voice-first technology on seniors. As executive director of the Front Porch Center for Innovation and Wellbeing, he oversaw a pilot project last year at the Carlsbad by the Sea retirement community near San Diego that introduced a group of residents to Alexa and then closely observed how their use of it evolved. Among the findings from the research (which initially included about 20 residents and later expanded to 90 homes, with most participants older than 80): 75 percent used the smart devices daily, and almost as many said Alexa helped them feel more connected to family, friends and the rest of the community. Once a connection was made and participants were trained in using the device, they started to explore other ways to interact with Alexa, such as using it to listen to audiobooks and get medication reminders. A second phase of the project offered residents the opportunity to see how Alexa can be tied to “smart home” technology. Soon, a number of them were controlling lights and thermostats in their homes with voice commands. That capability gave people, particularly those with mobility issues, a greater sense of control and independence, Park noted. They no longer had to bother partners or caregivers to turn on lights or adjust the temperature. Amazon’s Alexa still dominates the voice-first market, with other smart speakers, including Google Home and Apple HomePod, playing catch-up. Overall, it’s become a booming business, with sales tripling from 2016 to almost $25 million last year. It’s a smartphone app inspired by a real person named Marvee — the mother of its creator, Heidi Culbertson, a voice technology expert. Marvee, Culbertson explained, played tennis into her 80s, but then developed macular degeneration and became blind and frail. When the first Amazon Echo came out in 2014, Culbertson and her siblings bought their mother one. But Culbertson wanted to customize the experience for her mom and others like her. So when Amazon opened the platform to third-party developers, she went to work on an app that enabled people to use their voice to send messages to family members, friends, and caregivers. Through the basic Ask Marvee service, which is free, a person can send out a “Morning Beacon” every day to loved ones simply by saying, “Alexa, ask Marvee to say I’m OK.” Anyone on the pre-selected list will receive the notification by text, email or both. A person can also, through a voice command, request social visits and retrieve news and updates sent by family members. There is a fee to expand the list of contacts to 10 people ($15 a month) or 20 people ($20 a month). As Culbertson has trained older adults to use Amazon Alexa, she’s learned that the device can talk too quickly for some. Also, older adults’ voices can be weaker, and for those, she recommends using a remote that allows a person to talk to Alexa from a distance. It’s not quite like calling 911 — that can’t be done on smart speakers — but Ask My Buddy comes pretty close. It’s an app, accessible through Amazon Echo, Google Home and Microsoft Cortana (a voice assistant which is built into Windows PCs), that sends an alert to designated people. Once a person tells Alexa or Google Home, “Ask my buddy to send help,” a text message, email or automated phone call is made to everyone on that person’s Ask My Buddy list, and they’re asked to check on him or her. The alerts can also be sent to smaller groups, such as just family members, or to an individual. Ask My Buddy is free for 10 messages — each text and call to each person on the list counts as a separate message. A payment of $3.66 a month buys 120 messages and one of $5 a month buys 400 messages. While LifePod will use Alexa’s voice recognition technology, it promises to ratchet human-machine caregiving interactions up another level. Users will not need to “wake” LifePod with a command. Instead, the device will initiate conversations based on pre-configured schedules. The idea is to use prompts from LifePod to help older adults follow their routines. In the morning, they could be reminded to take their medicine or call a family member. In the afternoon, they might get a wellness check-in, such as a reminder to stay hydrated or get some exercise, or, if scheduled, the LifePod could play music. “The content is tailored to the needs of each individual user to help them periodically through the day,” said Stuart Patterson,” LifePod’s CEO and co-founder. If a person doesn’t confirm that he or she took the pills or doesn’t respond to a pre-set number of check-ins, a text is automatically sent to a caregiver or family member. Patterson said LifePod will be able to use artificial intelligence to recognize anomalies in the older adult’s condition and behavior, such as sleeping routine and physical activity, and make caregivers aware of lifestyle changes. LifePod aims to make a soft launch later this year. The cost is expected to be between $75 and $150 for the device, plus a subscription fee of $25 to $50 a month. This device moves into robot territory, but one that sits on a nightstand or table like a smart speaker. ElliQ, created by Intuition Robotics, is designed to interact with older adults — from sending and receiving messages to playing music to showing pictures of the grandkids. It might even suggest the user to take a walk if he or she has been sitting around all day. “Body language” has been incorporated into ElliQ so the device swivels its “head” toward someone who’s talking, and its “face” lights up when it’s speaking. The concept is to make ElliQ feel engaging, but without seeming too human. It’s meant to be a service bot, not a companion. That said, older adults involved in an ongoing pilot with ElliQ seem to have connected to it, according to Dor Skuler, Intuition Robotics’ CEO. “Testers refer to ElliQ as ‘she’ and they define her as a new ‘entity’ in the home — clearly not a person, but also not an appliance,” he said. ElliQ is currently being tested in seven homes in California, but Skuler said the pilot will expand to as many as 30 homes, including some in Florida. It’s tentatively scheduled to go on the market by the end of 2018. No price has been set. Voice-first technology helps older adults remain independent. At Bethesda, we provide the additional support needed so seniors can age in place. Contact us today to learn more about our in-home senior care services and Care Management program.